Heads + Tails. Cocktails win. This dapper new arrival on West End Lane gives the area a gentle shake-up, with its plush, atmospheric interior and two-faced menu of complex and carefully crafted cocktails. Stepping inside Heads+Tails is a bit like looking through the wrong end of a pair of binoculars: LA hotel opulence, with a glint of Art Deco meets 50s chic, neatly folded into a cosy and intimate bar space. The high ceiling avoids it feeling claustrophobic, and large windows make a silent yet bustling fishtank of the blaring T-junction outside. This is ‘Heads’, where menus are propped to show the corresponding cocktails – erring on the side of light and fizzy, gins and vodkas. The Dove (£10.50) blends pisco with Jasmine cordial while the house Pink Lemonade (£6) with Lillet Rose and homemade citrus sherbet is an enticing exponent of the lower-alcohol list. Flip the menu and you can order from the ‘Tails’ list, with offerings like the Twist of Fate (£10), which plays homage to the Old Fashioned, using citrus oil and spices to stir the bourbon. This side of the menu is perhaps better enjoyed downstairs in Tails itself. Darker and moodier, evoking Havana-meets-Boston, Tails is furnished with a back bar of rums and whiskies glowing dark gold in the subdued light. Visitors will soon be able to enjoy a garden space too, which opens this week. 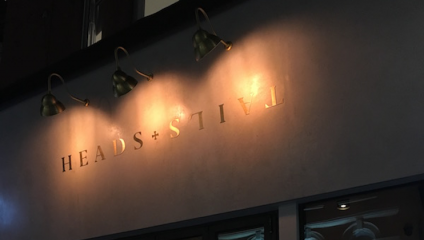 Head+Tails moved into the space left by the notorious Lately’s nightclub, opposite what was once Klooks Kleek, which saw performances from the likes of Cream, Stevie Wonder and Rod Stewart back in the day. Aside from the nods to vintage styles in the décor, you can feel that it’s a bar with a history. We spoke to the club’s owner, Will Partridge. Culture Calling: How did Heads+Tails come about, what was the inspiration? Will Partridge: It started about two years ago. I was in the bar as it was previously, Lately’s night spot, just chatting to the owner. He’d had it since 1979 and had run the bar by himself for nearly 40 years. So I was chatting to him about business, about his backstory. I think he mentioned that he was looking into retiring. It’s a great spot with great licence – it needed a bit of a refurb, but got me thinking that it could be quite a good venue, with a little bit of work. So I went back and eventually asked if he’d be willing to sell it to me. CC: So it’s a bar with a real legacy! WP: Yeah, at one time it was a casino, I think – Gordon [Stevenson – former owner] said it was a bit of a meeting place for London mobsters back then. I think that was way back, maybe in the 30s or 40s? WP: Our Heads menu focuses on lighter spirits and aperitivo-style drinks, so vodka, white rum, whereas the Tails menu features more darker spirits, heavier cocktails, things like Old Fashioneds, with lots of rum and whisky. We use a lot of fresh ingredients, and homemade ingredients like the sherbets and syrups. So in something like the Gloriosa Daisy you have tequila, pampelle, homemade grapefruit sherbet and fresh lime. CC: Who’s behind the menu? WP: The cocktails were mainly done by my colleague Chris [Dennis] who I’ve worked with on various projects for about 10 years. He’s done literally hundreds of menus and is the main mixologist; but we’ve got a strong bar team here – they all compete in cocktail competitions and things, so they’ve all had some input. CC: What are people going to love about drinking cocktails in Heads+Tails? WP: I think when you walk in the general vibe is really nice and welcoming. The fact that we have two opposing bars means that it caters to a lot of different moods – it offers two different drinking experiences, which is quite unique. CC: Any other cocktails bars you recommend elsewhere in the UK? WP: There’s a nice bar in Edinburgh called Bramble. CC: What makes cocktails special? WP: I think it’s getting the balance of flavours right, each cocktail is tailored to a certain style, sweet or bitter, but getting the flavours to work together is the thing.